Custom stickers can help you build awareness about a cause, an initiative you are campaigning for, showing your support for a political candidate, or running for office yourself. With sizes up to 11 x 14 inches, custom stickers with your messaging can also travel around as campaign bumper stickers, and become portable billboards. From the classic bumper sticker shape to custom shapes that outline your design, the shapes of your stickers can be as unique as your message. 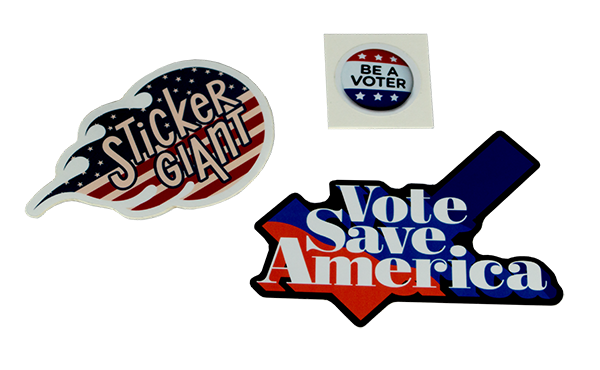 Custom campaign stickers are available in all of our custom sticker products, including Die Cut, Kiss Cut, and Clear Stickers. Spread your message indoors or outdoors with durability meant to last and withstand the elements. Build awareness around your campaign even easier with free shipping that is available for all of our custom sticker products. Campaign stickers can be small enough for someone to show their support for your cause on their water bottles, computers, and they work great for any level of campaigning, from the student class office races to professional political offices. 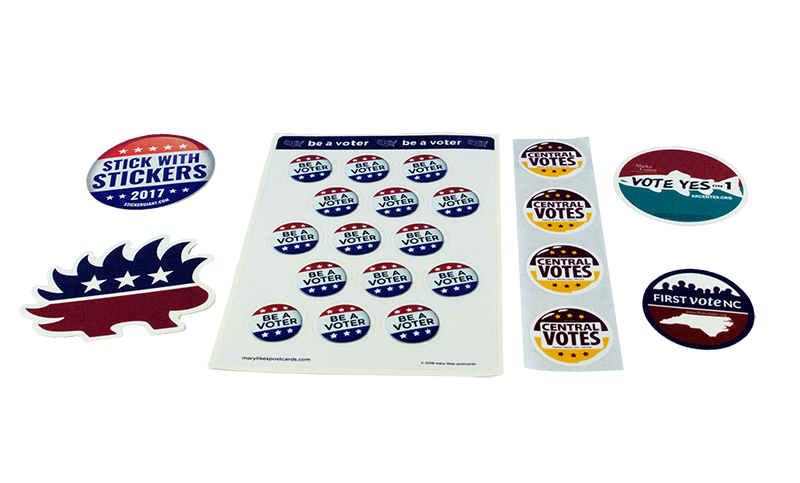 They are easy to share and are available in Die Cut, Kiss Cut, or Clear Stickers to match the personality of your campaign, and highlight the important action you are campaigning for. Stickers for your campaign are also a powerful way to let your audience show their support for your cause, allowing your supporters to campaign for you. Custom stickers can be handed out at your events, or used as a custom label on promotional items your audience will remember you by, such as water bottles you hand out to attendees. Whether it’s a campaign meant to build awareness about an important cause in your local area, supporting a candidate for a public office, or a candidate for a seat in their student council, stickers can be printed to support what matters to you.